A combined Friends List and Guild display. Written in response to SocialState falling into disrepair due to its author no longer playing WoW. 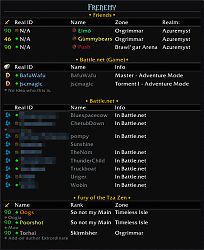 Separate sections for WoW friends (both in-game and RealID), Guild members, BattleNet friends in games, and BattleNet friends not in games. Sections are sortable, with indication for which column is being sorted on and whether it's sorted in ascending or descending order. Right-click context menus on RealID or Toon names. More to come Soon (™). This addon has been updated for Legion pre-expansion patch. Update is on Curse here. Last edited by Daveo77 : 07-21-16 at 07:18 AM. Re: Error with SuperVillain UI? I'm having an issue using this with Super Villain UI. I'm not sure if it's conflict or what. On mouse over this is what i'm getting. I'm going to go out on a limb here and say it's an issue with SuperVillianUI - this is showing a failure to find a screen location with LibQTip-1.0, which has been stable since 2008. Is there a way to sort the categories? I'd like Guild to be at the top of the tooltip, then Friends, then BN. Thanks. The 6.0.3.2 version has this capability. I realize you don't consider this feature complete yet and probably had intended to do some of this stuff already, but I figured I'd put together a rather comprehensive list of what I'd like to see. Yes, this isn't my addon, so I have no expectations that you'll do any of this. Iterate over BNGetNumFriendToons() with BNGetFriendToonInfo() to get information about additional characters/game instances. Shift+click to send a Who request. Ctrl+click to set a note (check CanEditPublicNote() for guild members). Ctrl+right-click to set an officer note if CanEditOfficerNote(). Clicking the broker opens the friends frame, so perhaps shift-clicking could be used to open the guild roster? Allow the guild message of the day to be edited when clicked if CanEditMOTD(). Add player's broadcast to the bottom of the friends list and allow clicking to edit, similar to the GMotD. Color levels using GetQuestDifficultyColor() instead of basing it off of max level. This will make it easier to see who else is on that is within your level range. Color realm names with faction color. Color zone names: Alliance, Horde, Contested, Sanctuary, Combat, etc..
Color guild ranks with a gradient based on their index. Consider giving notes their own columns to allow for more people to fit on the tooltip. Screen width is more abundant in comparison to height. Add a class column populated by class icons for another method of sorting. I can't click on guild members when I first login or reload the UI. However, if I open the guild frame it will begin to work. I can't click character names for Real ID/BattleTag friends. Is this intentional? I haven't checked the code. 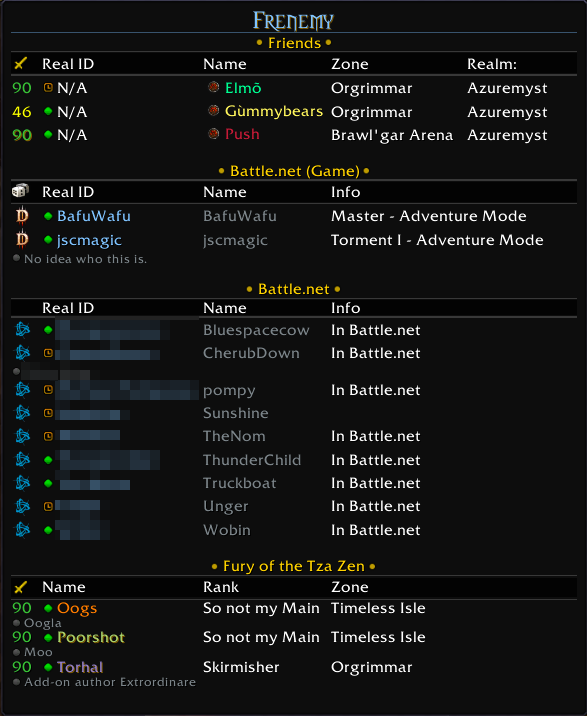 If you have a character added to your friends list that belongs to a Real ID/BattleTag friend, they appear twice. Why do this? Well, adding characters to your friends list changes the color of the name displayed above their head—making it easier to pick them out in a crowd. There is a colon used in the realm column header, but nowhere else. Last edited by Talyrius : 09-10-14 at 07:58 PM.